Do you want something new? Beautiful handmade Baby Bouquet! It can be used as a shower decoration or just to give as a gift or can also be used to welcome a new baby in the hospital room. This will add a very special touch and everything included can be used! Each Galvanized Bucket is made of Three bodysuits ; Four pairs of baby socks; One pacifier; One receiving blanket 100% Cotton; One washcloth. Measures 8" high and 7" in diameter. 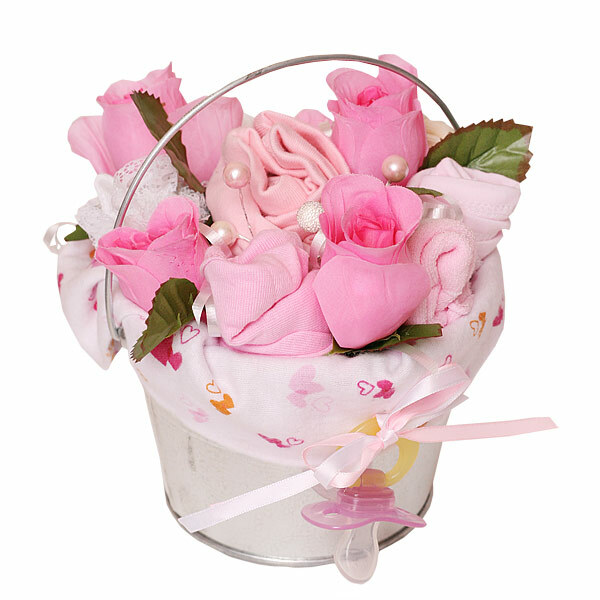 Bucket decorated with silk flowers. This very practical gift will be wrapped in clear cellophane and tied at the top with curly bow. All our gifts made of highest quality ingredients with greatest care and love. Everything included is ready to use and easy to disassemble.